I was not going to buy this–it’s basically some "branded" sheets of paper stapled together. I’ve liked stuff I’ve seen here and there over the years for this "24 Hour Comics Day" thing, but as my own notions of "drawing comics" are nearly a quarter-century in the PAST (I quickly realized MY actual creative enjoyment was in WRITING and creating a STORY, not in "art" in and of itself). But it occurred to me that as a Superman fan all this time…something like this–it’s NOT a "variant cover"–would be interesting as something to maybe start taking to conventions or such. Get signatures and sketches in it. Depending on pricing and timing, perhaps find a Superman artist I like to get a cover image done, another for a "back cover," and of course, whatever sketches and such inside–24 pages’ worth of room for all that. The physical stock of this thing is significantly thicker/better than a typical comic…it’s obviously designed to be able to handle drawing utensils being applied to the pages without shredding or necessarily (?) bleeding through. For "only" $2.99 and NOT being "stuck" or "typecast" or whatever to a specific issue–even if I were to, say, ONLY get a "cover sketch" or such done–this is NOT a "variant" cover. It’s would not be getting Superman (2018) #1 "blank cover variant" signed or sketched on; it’s not something I’d feel I’d need to file with any given SERIES, etc. It’s $2.99 for a glorified packet of paper, though, so by no means for everyone. I also (initially) had the motive of thinking I’d be "cute" and post a "blank" review for a "blank" comic, $3 for a stupid bit of snarkiness or sarcasm or whatever. I have no idea how many of these DC was producing (I don’t really care offhand) nor how easy to get it’ll be in the future. 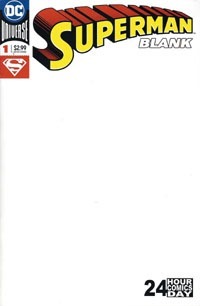 Though blank, this has the typical modern/current DC Comics (DC Universe) branding and cover dress with the Superman logo in the iconic yellow and red; this is perfectly sized as any other comic, so it’s not some giant sketchbook or mis-sized anything…this will easily "disappear into" my collection with all my other comics if I’m not careful to keep it separated somewhere. As this is not something with or of story-content, the price is for the convenience, size, and so on. There is no art whatsoever to this that is not shown on the cover. There’s a generic barcode with the typical TM & Copyright DC Comics / Printed in Canada notice on the back. You’re not missing any art from anyone nor any story/content from anything. No reprinted material, no exclusive material, etc..
As I’ve glommed onto using this for autograph/sketches, I’m liking it all the more, envisioning a mix of perhaps established Superman artists and just artists whose work I like adding something to a page or pages. For $2.99…that’s quite a good deal to me, and very much worth it for my own purposes. This is the fourth and (presumably) final issue this time around. Several years ago, they did a run of #s 1-4, and the next promotion had #s 5-9…so I would not be shocked if that happens again (or not, either way). But to my knowledge, for the current promotion, there are only four different issues, of which this is the last. This was probably my favorite read of the four. Perhaps its the immediacy of it–the most recent one I read–as well as the generic feel of #3 that this certainly topped by far. But I really enjoyed this in and of itself. A giant alien ship shows up over San Diego, and begins sucking up the ocean just offshore. Aliens broadcast to the world what they’re doing and why–they’re taking Earth’s water, as Earth has too much of it and their world doesn’t have enough, and that’s just a huge injustice! The League springs into action, attacking this threat on multiple fronts, each to their strength/specialty. As this is an Aquaman-centric issue, he gets more page time and we get stuff more from his point of view…including the requisite (for this series) “flashbacks” to his youth. As the present-day situation continues, we flash back to see a young Arthur dealing with being of mixed heritage–part surface-dweller, part Atlantean. He sees people react to the notion of someone different, and then talks with his dad, who advises him on the wisdom of finding common ground when one is so different from another. Young Arthur gets a tangible opportunity to put that advice into practice when he encounters some Atlanteans threatening some local fishing boats. The lesson apparently stuck with him, as back in the present, he devises a solution and quickly acts to implement it. With help from (perhaps unexpected) sources beyond “just” the League, a bad situation is halted, with a bit of potential redemption coming out of it, with elements of a win/win scenario. I was comparatively quite disappointed with the last issue and its feeling of being so generic after the first two issues of this “series.” This issue gets us back to “Name Creators” that I recognize, and is a second Bedard-written issue…with art from Tom Grummett, another creator whose work I quite enjoy, period. As such, it should not have surprised me to enjoy this story as I did. It’s a self-contained piece, and does include a bit of that “special message” peachiness to it…but that’s mitigated quite a bit by my relative lack of familiarity with details of Aquaman…he’s a character I’m pretty aware of while having quite the significant blind spot. Though I’m certain this issue’s flashbacks are “new” and involve a version of the character perhaps different from others…it doesn’t bother me as I have so very little to compare it to. That lack of familiarity also lent itself to my being able to TRULY appreciate this as I believe one would hope the target audience would/could: this makes me a little more familiar with the character and his background, shows me some important elements of the character, and generally serves as a bit of a touch point for me. 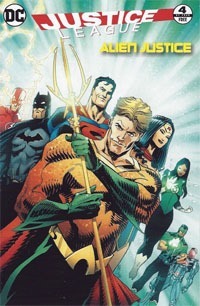 It sets some of my character-specific expectations for Aquaman in a way that the other issues did not do for the leading characters…and reminds me a bit of the impact The Untold Legend of the Batman had on me as a kid and my then-knowledge of Batman, or that The Man of Steel #3 “audio comic” did for my understanding of Superman. Grummett‘s art carried a definite sentimentality for me…the visuals for this issue reminded me of other work he’s done, particularly his prior work on Superman, as well as Robin and Superboy. That’s certainly a good thing–as is the art in itself. This is not just a good-looking “cereal comic,” but a good-looking comic, plain and simple! Though I’d be inclined to choose Superman or Batman first…this Aquaman issue is definitely THE treat of the set, and very well worth reading if you find it! I like these semi-yearly promotions, with DC Comics in cereal. However, this has been THE worst one yet, from two prior Justice League sets and last year’s Batman v Superman: it took an absurd 19 or so boxes of cereal for me to get ONE copy of this 3rd issue. (Meanwhile, I have 9 of #4!) And contrary to the first two issues by what I would consider "name creators" that I recognize, this issue is the worst of the three so far. Or perhaps "worst" is a "strong word," but this is the most generic of the three so far, and comes off worse for comparison to the first two issues. 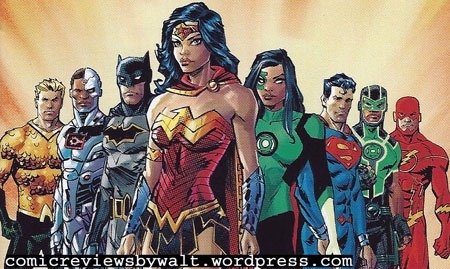 This one focuses on Wonder Woman where the previous two focused on Superman and Batman, respectively. The Justice League arrives at the site of a volcano that’s about to erupt. 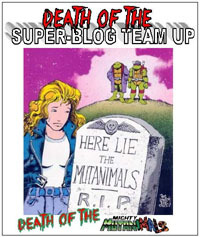 The team splits up to approach the situation in their own ways to try to minimize destruction. 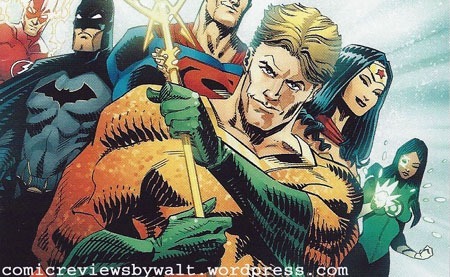 Aquaman winds up unleashing an underground stream, dousing the League. Then everyone turns on each other, apparently selfish and irritable and downright mean. Wonder Woman–Diana–reflects on an incident from her childhood where she was hurt by stuff her friends had said about her and fled to another island, where she faced the wrath of a minotaur. Based on that experience, she applies the lesson to the present and ultimately the group discovers that something in the water had affected them all, and they resolve the conflicts by admitting the truths that were brought to the surface, and are able to deal with the volcano, preventing any loss of life, though there’s plenty of property damage. Finally, Diana proclaims that real friendship can survive any revelation, and the Justice League are the truest friends of all. Again, this is the most generic of the issues for this promotion, and comes off that way both story-wise and perhaps even moreso, visually. The story reeks of the "very special episode" and such…perhaps I’m also annoyed and more sensitive to it given the number of duplicates of the other issues I amassed just trying to get this one. But I didn’t feel like the other two issues were nearly as "preachy" on the "special message," though I had noticed a "message" to each of those as well. The art here is ok–not horrible, but far from wonderful. 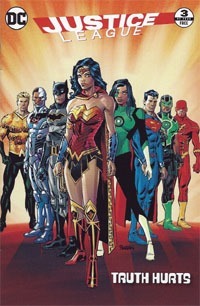 The characters and designs are recognizable but seem a bit inconsistent, and lacking the "big name" or "recognized" creators, this comes off all the more as what it is–a generic freebie from a box of cereal that happens to have "current" versions of costumes with characters that aren’t given room for much depth (a one-off single-issue story with numerous characters and an attempt to "focus" on Wonder Woman). That I went through the hassle I did, accumulated a year’s worth (or more) of cereal goes to show my personal OCD and such (and marks me as an ideal "target" for this sort of promotion!). Though the numbering of these–#s 1 through 4–makes for a "complete mini-series" of sorts, if you’re NOT interested in having all four, I would not worry about trying to get this issue unless you want the specific focus on Wonder Woman (a focus that is more of a "gets more pages" than being a Wonder Woman STORY). Ultimately, for a "free" comic from a box of cereal, this isn’t horrible, but is far from wonderful. I found myself recalling the likes of The Untold Legend of the Batman, which I believe had a "cereal edition" in the mid-1980s. Those were reprints of an actual in-continuity story…I think I’d almost rather see something like that (re)-attempted…or at least, I think something like this (offering miniature editions of comics in cereal) would be ripe for promoting some of DC‘s actual #1 issues to try to hook readers. I certainly would not begin to consider this issue "worth" a standard cover price, and not worth the boxes of cereal I bought to acquire it…though at least the variety and quantity means I’m not going to have to buy cereal again for a long time, as I will actually (eventually) use it all. This is the "second" issue of four being made available to the public "blindly" via insertion into specially-marked boxes of General Mills cereal. Though the issues ARE numbered, the first issue and this one do not seem to draw on each other or lead into the other with any singular story, so the numbers are–I’m pretty confident in saying–there to stimulate collectors’ OCD to collect ’em all. 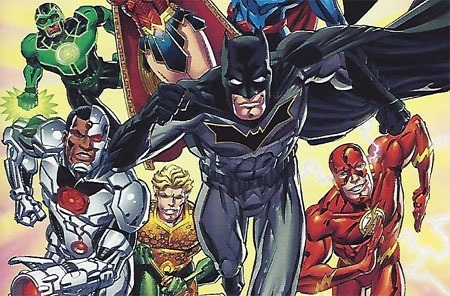 This issue focuses on Batman, though it guest-stars the rest of the Justice League. Batman arrives home after a "typical" night out. After talking with Alfred and having a flashback to his youth where his parents were still around, Bruce catches a glimpse of a reflection in the mirror that is most certainly not him looking back! Turns out that Mirror Master (one of Flash’s Rogues) has expanded his reach (with the unintentional assistance of Flash himself) to vex the entire Justice League. Using mirrors as gateways, interdimensional counterparts of our heroes are brought through, and the heroes square off with them. While everyone tangles with their mirrored counterparts, Batman (through recalling an incident from his youth) develops a plan to deal with this threat and stop Mirror Master. Nicieza and Leonardi are a couple more names that I’m definitely familiar with, though I’m far moreso with the former than latter. I’m honestly impressed at the way this issue–and this round of GM Justice League as a whole–has the talent and appearances of something much bigger and less generic than "just" cereal-box comics. At the same time, unfortunately (by seeming necessity) these ARE rather smaller and more generic than non-cereal counterparts. 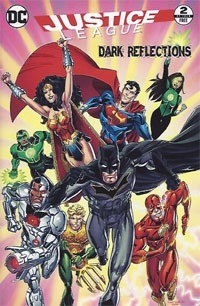 The story itself is fairly basic, drawing on some basic tropes of comics in general…particularly the lead-in with Batman having just gotten back from a night out, talking about the off-panel adventure, remembering something from his childhood while his parents were alive, and that conveniently being relevant to the current story at hand. Yet, while that may come off as a negative…it fits perfectly into what these comics can and might be–someone’s first. These days, it’s not hard to imagine that there are countless staunch fans of even "obscure" comic book characters…yet said fans may never have actually experienced a comic book! So while these are overdone, overly-familiar things to me as a nearly-30-years comics reader, they may well be someone’s first exposure and be at least some small part of their journey into comics. The story elements overall do not particularly contradict what I know of the characters, and particularly Batman in this case, though this definitely comes detached from the nuances of recent continuity that I’m familiar with. My biggest eye-opener is the notion of the characters nonchalantly hauling the moon out of its orbit with zero repercussions to the Earth. Perfect for a comic like this, maybe, but epic event-level stuff in general continuity. Visually, if the pages were "regular" sized and I didn’t see a cover, I wouldn’t really know this was "just" some cereal-box comic…it has "established talent," and does not look like some generic thing. The art is quite good in and of itself, though as with a lot of comic book art, its primary drawback is simply in not being by one of a handful of my favorite comic artists. Once again, these characters look like they’re right out of early-2017 full-size DC comics, down to Batman’s current gold-outlined black bat symbol. Superman’s look is about to be out of date, but fits well into the past ten or so months’ worth of DC Rebirth. As with the first issue, this was an ok read with good art. It’s a cereal comic and certainly worth reading, but it in no way affects continuity nor particularly draws from it. You might appreciate this more if you’re NOT up on current comics, as you may be less likely to do hard comparisons. I wouldn’t go out of the way to hunt this down, but if you like the cereal and it’s in the box, definitely give it a read-through! Once again, DC Comics and General Mills have teamed up to put comics in boxes of cereal. And, once again, I’m buying cereal specifically to get a copy of all four issues available as part of the promotion. This is the fourth such promotion I can recall in "modern" comics’ times–two prior Justice League runs, last year’s Batman v Superman, and now this. As with the previous ones, these LOOK like they fit in with contemporary issues, just that these are missing UPC boxes, and are atrociously TINY. But hey…they’re "free" with the purchase of a specially-marked box of cereal, and no hassling with coupons, mail-aways, shipping/handling, etc. As with previous promotions, though these issues are numbered, I’m almost certain there’s no sequential "continuity" to them–this first issue is self-contained with no cliffhanger or anything "driving" one to the next issue. I’m pretty sure the PRIMARY purpose of the issue number is to help "legitimize" the thing as a miniature comic book (and not just some mini-magazine/"insert" or such) and to–as successfully accomplished with me–trigger the OCD to track them all down, because darnit, there are FOUR numbered issues, so I want all 4 issues, and won’t want to have a #4 withOUT 1-3 and so on. Getting to the issue itself, as an issue…I’m quite impressed with the main creative team. Tony Bedard‘s name is definitely recognizable to me, and even topping that is artist Jerry Ordway, who is an old favorite from my earliest days in comics. The story is rather prescient given its timing–at least for me as I read this. 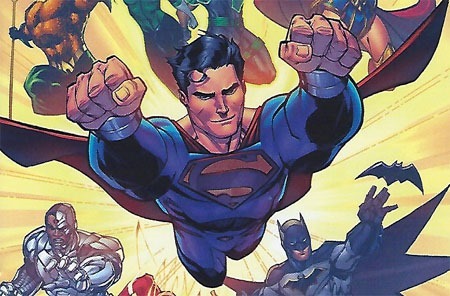 We open on the Justice League (current Rebirth incarnation, with everyone looking on-model for Rebirth year one) in Metropolis, being celebrated for all their work and constant saving of Earth. A large group statue is unveiled, and almost immediately comes to life, forcing the Leaguers to face off against their giant bronze counterparts. The mischievous antagonist is quickly revealed: Mr. Mxyzptlk! Muddying matters, the League must summon Bat-Mite–another 5th-Dimensional imp–to counter Mxy’s fun. Tricking Mxy yet again into saying his own name backwards, Bat-Mite extracts a promise from the League and then disappears himself…a small bronze addition left with the once-more-inanimate statue, celebrating Bat-Mite side-by-side with the rest of the League. This story comes outta nowhere: no prologue, nothing setting it up. Just the "typical" generic "our heroes gather to be celebrated by the common people they’ve saved, however reluctant they may be with such adulation and then must save them yet again." Of course, this is NOT some issue partaking in any crossover or event, nor is it "merely" some reprint of just any random issue from within a run…and it’s not anything someone reading the regularly-published comics needs to track down to get a full story, so it’s rather necessary, then, for this to be its own thing in a relative "vacuum." Additionally, there is no cliffhanger, nothing left hanging to "force" or "coerce" someone (while many adults may track these down, I’d assume a large majority of readers are children whose parents had to provide the cereal for them to have the comic) to "have to" get the other issues. 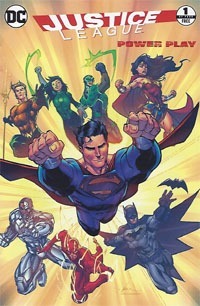 Yet, while the story is pretty simplistic, and doesn’t necessarily play up individual character elements that’d be present in solo books, the characters are recognizable as who they are, and the lineup seems to fit in such that someone reading this and then walking into a comic shop would easily find current DC issues featuring these very characters. Bedard doesn’t really get room to shine as a writer, but he doesn’t play the characters as fools or overly talk down to the audience (though there’s a little bit of that "special lesson" to be imparted to kids: "don’t run from your problems, own up to them…and sometimes you will have to ask for help from others, and that’s ok."
The cover’s art is a bit "off" and generic to me….Superman’s costume (at least on my copy of this issue) seems a bit weirdly-colored and the whole image is basically generic poses of the characters on a yellowy-orange burst-effect…no background setting or situation (though also nothing to give away the antagonist from within). Ordway‘s art on the interior is a huge treat for me, and I really like the depiction of the characters. I don’t much care for Simon’s version of the Green Lantern costume–never have–but it looks as good as is possible here. And somehow most notable to me, Mxyzptlk looks really good in this issue–much like in my first conscious exposure to the character back in 1989 or so. I imagine I’d have quite loved this as a kid. As an adult, it’s simplistic but pretty…and as something "free" in a box of cereal, it’s much better than it has any "right" to be. Even if you’re not a fan of the cereals, I’d recommend this as a quick-read novelty item…especially as I doubt this or any of the previous ones will ever warrant a full-size collection of their own, so this is likely the only way to read ’em! I bought this volume for full cover price at Book-A-Million a couple weeks ago. Which is something EXTREMELY rare for me to do, as I’m highly disgusted at the (over-)pricing of collected volumes these days. I look primarily at Marvel (as I have most of what I want from DC, find what I yet want from DC quite reasonably price, and/or don’t much care for their newer stuff). With the Marvel volumes, it seems that where once a 6-issue arc could be had for about $15 (making it a better value than the single issues), now the standard TPB is $16.99-$18.99 and hardbacks $20+ for 4-5 issues, making the single issues an equal or better value. As such, THE vast majority of my collected volume purchasing is done through Amazon, InstockTrades, CheapGraphicNovels, Half-Price Books, M&P Used Books, bargain bins, or other bargain purchasing conditions…typically seeing me paying only about 50% of printed cover price on average. Which brings me back around to (ostensibly) the main point of this post: Superman vs. Zod, a new TPB collecting several “classic” Superman-vs-Phantom-Zone-villains stories. Despite my above-mentioned purchasing preferences…I still enjoy taking a peek at the “regular” bookstores (Barnes & Noble, Books-A-Million) to get a look at some of these volumes “in-person” in a way that can’t be duplicated by solicitation and other info online. So I was looking at the Superman volumes, and happened to notice this Superman vs. Zod volume. 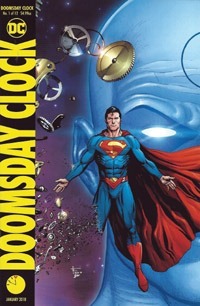 I’ve been increasingly interested in some of these classic “themed” collections–Superman/Batman: Saga of the Super Sons, Superman: The Bottle City of Kandor, Superman vs. Brainiac, Superman vs. Lex Luthor, pretty sure there’s a Daily Planet volume–so this one being new, I was curious. I pulled it out, glanced at the table of contents (determined it was mainly “classic” material in the vein of these other books), but because it was a bit thinner, glanced at the price–figuring it was a $15 book (the others being a bit thicker were $20 books, I believe). I was surprised to find that this was priced at $9.99…and bought it. $10 is not nearly as off-putting as “more than $10,” be it $10.99-$19.99 and on upward. And because Amazon and other places often seem to have a $10 minimum–typically I see Amazon at least keeping to the $9.99 pricing on such-priced volumes–I don’t mind “paying full price” on a $10 book that feels worthwhile, as this one did. Had it been even $12.99, I’m quite certain I would have put it back on the shelf. But it had the “magic” reasonable price where the sheer thickness of the book feels worth $10 compared to volumes maybe 2/3 its size commanding twice the price. The stories themselves were definitely “classic.” We get The Phantom Superboy from Adventure Comics #283 (1961), The Great Phantom Peril from Action Comics #473 (1977), Escape from the Phantom Zone and Superman Meets the Zod Squad from Action Comics #s 548 & 549 (both 1983), Phantom Zone: The Final Chapter from DC Comics Presents #97 (1986) and then jump 21 years to The Criminals of Krypton, a segment from Action Comics #10 (2007). 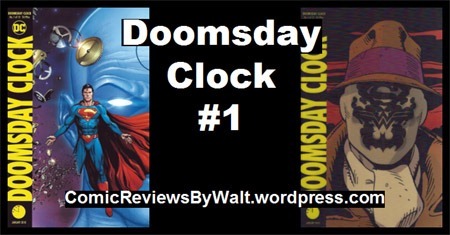 While I can “appreciate” these stories for what they are–stories involving the Phantom Zone–I was not particularly enamored with any of them. The cover certainly doesn’t quite fit–it’s a very modern take on the characters, compared to the very silver/bronze age art on the inside. Which isn’t to slam the art–it’s a product of its time(s)–but it’s not much a visual style I tend to enjoy these days. The story themselves also are products of their times–particularly the first four, which were largely “painful” to read…the first most of all. The DC Comics Presents story struck me as the most mature of the classic bunch, and actually put me very much in mind of the Last Days of Krypton novel I read a couple years ago by Kevin J. Anderson, making me wonder if he drew inspiration for his story from this one. These were all stories that I’m pretty sure I’d NOT previously read, except the last one, which I recall as I bought/read the original Annual. I haven’t much cared for all the “going back to silver-agey elements” of the post-Infinite Crisis DC stuff, but can’t deny that its presentation of Non makes that character a bit relatable, rather than just some mindless brute. 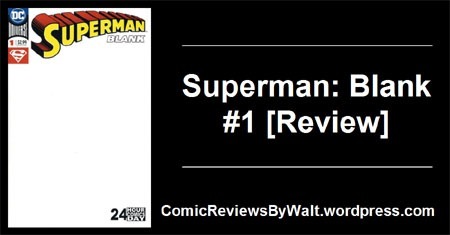 This volume’s titled Superman vs. Zod, but seemed to be more generically a Phantom Zone volume. As something involving Zod, I’d’ve expected at least an issue from Byrne‘s run, with the Matrix/Supergirl stuff and the pocket universe, if not specifically Adventures of Superman #453 from the Exile story where Superman hallucinates an encounter with the ghosts of Zod & co. There’s also stuff from around Our Worlds at War with that version of Zod, (which I honestly don’t recall if it was different from the Zod used during For Tomorrow) or not, that seem more fitting to me for this volume, if not as neatly self-contained. The Zod presented in these stories seemed a bit generic, if not outright a lesser character than Faora. 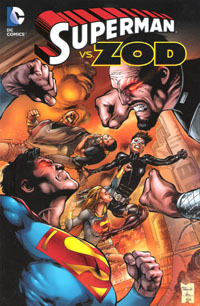 Yet, it seems to me that Zod in general pop culture is defined by Terrence Stamp‘s performance in the Donner films with Christopher Reeve, particularly the infamous “kneel before Zod.” (There was also the Smallville depiction of the character late in that series that may be just as or more familiar to contemporary audiences). So overall…for a $10 volume, I found this to be well worth the purchase. The stories are a bit on the lame side to me, but they’ve added to the range of Superman stories I’ve read, now, and given me just a little more knowledge of the actuality of these characters; and the more I think about it, the more I do think I rather enjoyed the Phantom Zone: The Final Chapter story (which must’ve come out in that in-between as the original Superman stuff was wrapping up and things were being put in place for the Byrne relaunch and the version of the Superman stuff that I grew up on and consider to be “my” Superman). This is sort of a “classic-lite” volume–I’d say it mostly fits with those other themed volumes of classic stuff, though it’s far from comprehensive and is not quite as large; but at half the price, not bad to be an “intro” volume. Cover copy suggests “Before Superman takes on General Zod in theatres, read here a collection of classic Zod tales spanning nearly fifty years!” So the pricing and mere existence of the volume seems more a promo type thing to tie in to this summer’s Man of Steel…I would unfortunately assume it’ll be someone “lost in the crowd” of all the other DC books and Superman/Justice League stuff, and definitely be victim to the “spine-only” trouble so many volumes face in comic shops and the bookstores.